Administered by both the Provinces of Florence and Siena, during the Middle Ages, Chianti was harshly contested by these two rival cities until 1555 when the Medicis imposed their hegemony on all of Tuscany. It is difficult to trace its borders since only the mountains of Chianti in the East separate it from Upper Valdarno in a natural and neat way; the remaining territory fades into the hills of the Arbia, Elsa, Greve and Pesa rivers. Mediaeval villages, castles, churches, abbeys, monasteries, cottages and villas lie one after the other in a fantastic itinerary that exalts the activity and inventiveness of man; centuries of work have modelled the hills of this region and the alternation of vineyards, olive groves and forests creates a harmony unique to the world. The visitor will be offered an unforgettable countryside always varying and harmonious and so diverse in colours and in atmosphere with the changing seasons. There are many ways to get to one of the parish churches, castles or isolated towns, silent witnesses to the historical and artistic richness of the Chianti region. It does not matter how one gets there: whether by car, motorcycle, bicycle or bus, there are many possibilities for staying and enjoying a few days’ holiday in the relaxing atmosphere of Chianti, tasting the gastronomic specialties of the region accompanied by wines that have made Chianti famous all over the world. It owes its name to the “tabernulae”, the stop‑over and rest points along the “via regia” that linked Florence to Siena and then to Rome. This area has numerous interesting churches. 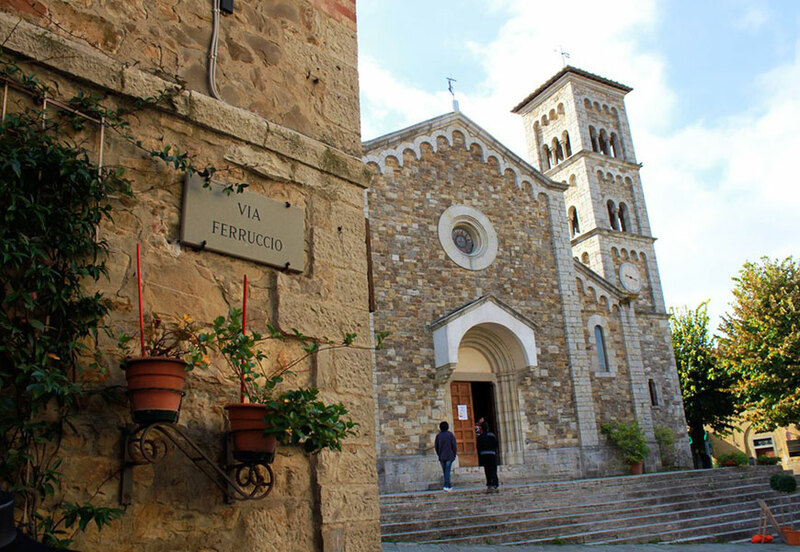 At one extreme of the inhabited area there is the church of S. Lucia al Borghetto (XIII century) an ex‑franciscan convent in Gothic style where a precious Crucifix of thirteenth‑century school and an Annunciation by Neri di Bicci are kept. Just out of Tavamelle, after leaving Via Cassia, one reaches Morrocco where it is possible to visit the church of S. Maria del Carmine, built in the 1400’s and then largely remodelled. Inside, a glazed terracotta of the Annunciation in Andrea della Robbia’s style is preserved, and aserics of fresco fragments from the 1400’s. Not far from Morrocco is the old parish church of S. Pietro in Bossolo. In the presbytery, there is the Museum of Sacred Art where works from the churches of small abandoned towns are preserved. In the territory of Tavarnelle San Donato in Poggio is definitely worth a visit. It is a small Medieval village that still preserves notable remains of boundary walls, buildings of the 1200‑1300’s, the Renaissance Malaspina Palace, the church of S. Maria della Neve (XV century) in Gothic style and the Romanesque parish church of San Donato where a beautiful baptismal font in glazed terracotta by Giovanni della Robbia is kept. From Sambuca along the road to Greve, one comes across the majestic Badia a Passignano Abbey founded in 1049 by monks from the Vallombrosian order. Immersed in the countryside, surrounded by an intense cultivation of olives, the abbey is striking for its fortress‑like appearance, with its walls and battlement towers. Among the numerous works of art preserved in the abbey one must remember Passignano’s frescoes (1601) in the main chapel and above all the fresco of the Last Supper by Domenico and Davide Ghirlandaio (1476‑77) in the refectory of the monastery. 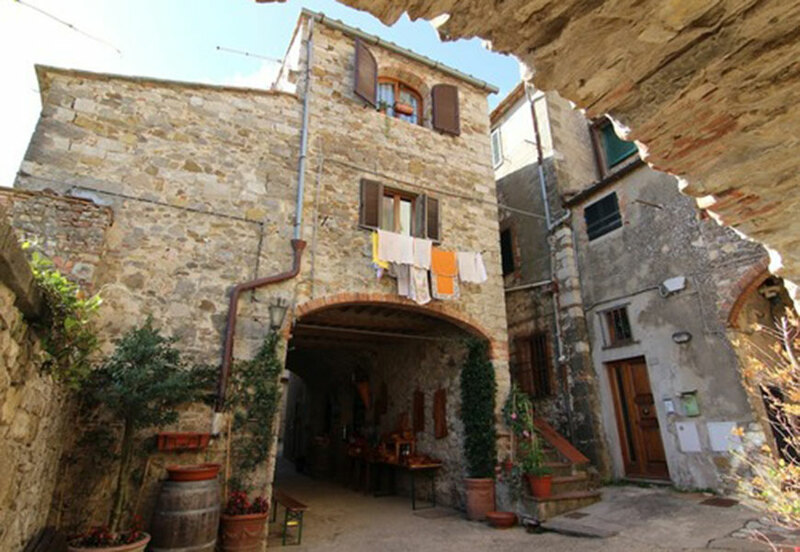 Greve is situated at the intersection of the roads that linked Florence and Siena and Upper Valdarno and the Valdelsa. It began to develop as a “market place” for the principal castles of the area in the XIII century. Greve’s main Piazza, is characterized by an original formation of irregular triangular shape, defined by beautiful long porticos. Today it is still an important point of exchange, particularly on the occasion of the Mostra Mercato del Chianti Classico (Chianti Classico Wine Fair) that takes place there every year in September. The Montefioralle castle dominates Greve, which still maintains intact the original Medieval town structure with a narrow ring‑road that follows on to mect the little church of S. Stefano, where an. interesting twelfth‑century Madonna and Child is preserved. 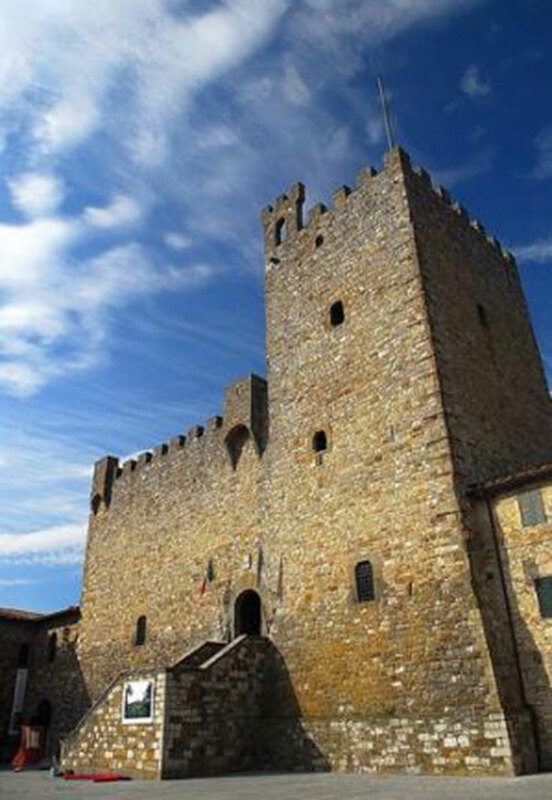 The Castles of Uzzano, Verrazzano, Vicchiomaggio and Lamole are also notable. A short distance from Greve, in the Panzano direction, Vignamaggio Villa can be found, where, according to tradition, Mona Lisa ‑ made famous by Leonardo ‑ was born. The Romanesque parish church of Panzano or S. Leolino, dating back to the X century, preserves important works of art, including a precious panel with the Madonna on the throne Saints Peter and Paul and stories of the two saints, attributed to Meliore di Jacopo (XIII century). Long‑standing feudal domain of the Trebbio family, Castellina passed over to Florence in the XV century that surrounded it with walls making it one of the most important battlement locations against Siena. The Medieval Fort dominates the country, but that which bears witness more than anything else to Castellina’s Medieval past is surely the Via delle Volte, a walkway set into the walls of the town which offers, limited but exceptional panorama, seen through the arrow­slits. Just outside the inhabited centre lies the Etruscan ipogeo (underground cave) of Montecalvario, a rather imposing grave for dimensions dated to the VII‑VI century B.C. that, together with other tombs identified in various other locations, bears witness to the Etruscan presence in Chianti. Radda in Chianti is on the boundary of Florentine and Sienese territories and was often involved in troubled historic affairs. It was the headquarters for the Lega of the Chianti region ‑ an autonomous jurisdiction created by the Florentine Republic in 1250 which also included Castellina, Gaiole and Greve. Apart from the urbanistic structure in an elongated elliptical plan, there remains in Medieval style only a few sections of the periphery walls and various towers. The Pretorio Palace however, is of interest, built in the 1400’s and adorned with official mayoral stems. Only a short distance from Radda, in the direction of Lucarelli and Panzano, indications for the Romanesque parish church of S. Maria Novella are found, unique in the Chianti territory for its capitals decorated with animalistic symbols, monstrous figures and floral drawings that bring to mind the Romanesque parish churches of Valdarno and Casentino. 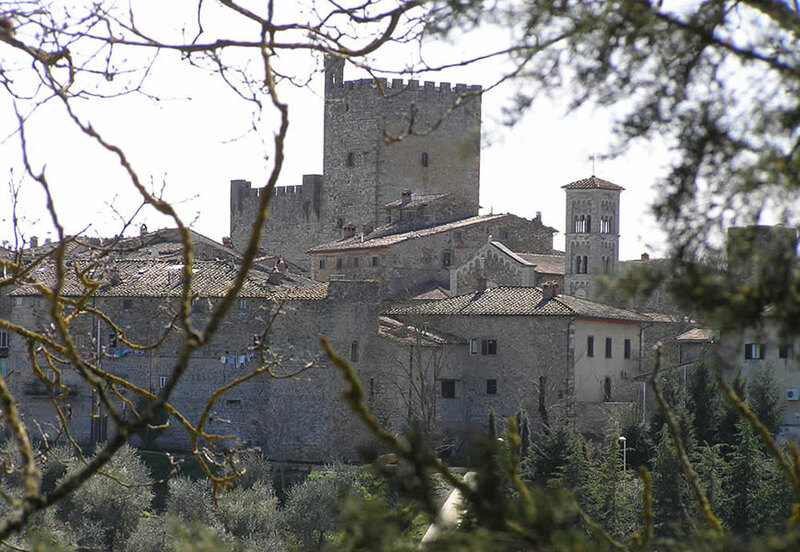 The Volpaia castle is a small Medieval agglomeration that is certainly worth a visit. Inside the walls is a labyrinth of little paved lanes preserved between arches, palazzos and the little Renaissance church of S. Eufrosino (XV century). 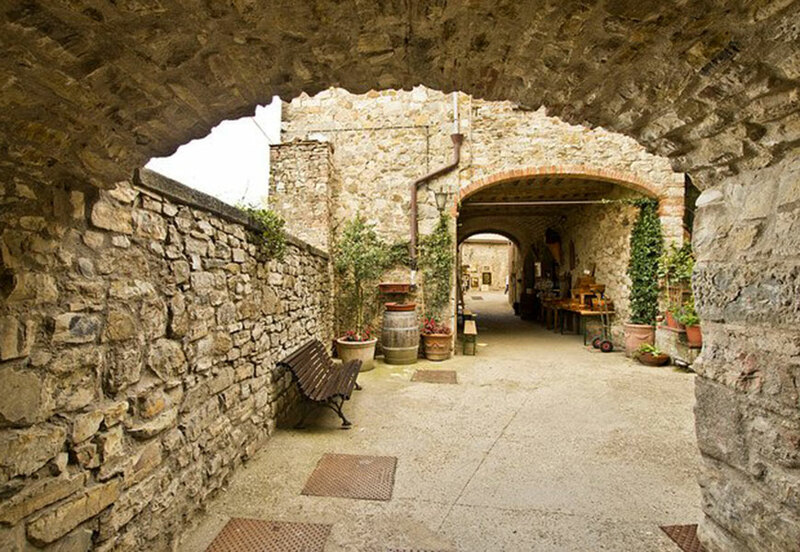 During the Middle Ages it was an important market place, developed along the road for Valdarno. The numerous castles and parish churches in the vicinity bear witness to an intense and prosperous agricultural and commercial activity. Among the castles, which were all established in the Middle Ages, of particular interest is Vertine, also Meleto with its two majestic rounded angular towers, Barbischio, and above all Brolio castle. A patrol walkway runs on top of the walls and bastions that surround the town, from which one can enjoy a beautiful panorama of the Chianti region and the Sienese countryside. The castle, completely destroyed in 1478, was reconstructed in the last century on Bettino Ricasoli’s wish. At less than 1 km from Gaiole, the beautiful Romanesque parish church of Spaltenna is worth a visit, while on the road to Valdarno, immersed in the green of age‑old fir‑trees, is the Abbey at Coltibuono. A large part of the majestic complex of the abbey that was constructed by the Vallombrosan monks is now private property, the Romanesque church and the massive embattled bell­ tower. Castelnuovo Berardenga is a southern offshoot of Chianti. The original town dates back to the IX century when it was a feudal complex called “terra berardinga“, but only a thirteenth‑century tower and a piece of the periphery wall remain of the old arrangement. However, of architectural relevance, overhanging the town is Villa Chigi Saracini with its large park. Property of the Florentine bishops since its foundation, San Casciano was annexed to the Florentine Republic in the XIII century and was subsequently fortified, turning it into a castle of defense against the dangers that originated in the Sienese countryside. Many traces of the boundary walls and the Medieval towers remain even today. The Museum of Sacred Art set up inside the Church of S. Maria del Gesù holds precious works of art from all over the region. The altar frontal attributed to Coppo di Marcovaldo representing San Michele Arcangelo and tales of his legend and the Madonna and Child by A. Lorenzetti are certainly the two most important works. Among the principal monuments are the Collegiata and the Church of Mercy (or S. Maria al Prato) that preserves a rich patrimony of works of art, including a Crucifix by Simone Martini. The churches in the area are numerous and bear witness to the importance of S. Casciano in the MiddIe Ages, many of which are worth a visit, including the parish churches of S. Cecilia a Decimo a little out of the inhabited centre, S. Giovanni in Sugana in the Cerbaia direction; and S. Stefano a Campoli (dated 903) in the vicinity of Mercatale Val di Pesa. We also remind you of the many villas around S. Casciano, including Villa i Collazzi and Villa Tattoli near Cerbaia and, in S. Andrea in Percussina, Villa Bossi‑Pucci so‑called Albergaccio, famous for Niccolò Machiavelli’s stay. Impruneta was already inhabited in the Etruscan and Roman era, and during the Middle Ages was tied to the political and economic affairs of nearby Florence. The real propulsory centre of the community of Impruneta was the parish Church of S. Maria, founded in 1060, that became, in a short time, an important sanctuary to the Virgin Mary. The church, originally in Romanesque style, underwent numerous revisions over the centuries, and at present only the original crypt has been preserved, while the church presents a sober Renaissance‑style appearance. Inside, works by important artists are kept, including some by Michelozzo and Luca della Robbia and an miraculous icon of the Madonna is venerated ‑ which tradition says was painted by Luke the Evangelist. The veneration of the Madonna of Impruneta has encouraged the accumulation of precious gifts and votive offerings over the centuries, which are now kept in the Museum of Sacred Art adjacent to the church together with miniature manuscripts, gold and silver. Thanks to the great tradition of the earthenware and terracotta kilns, the cotto of Impruneta has become a characterizing and distinctive element of the architecture and of the Tuscan countryside, beyond being a famous product exported all over the world. Leaving your email, you accept the terms of privacy and you'll receive our newsletter.